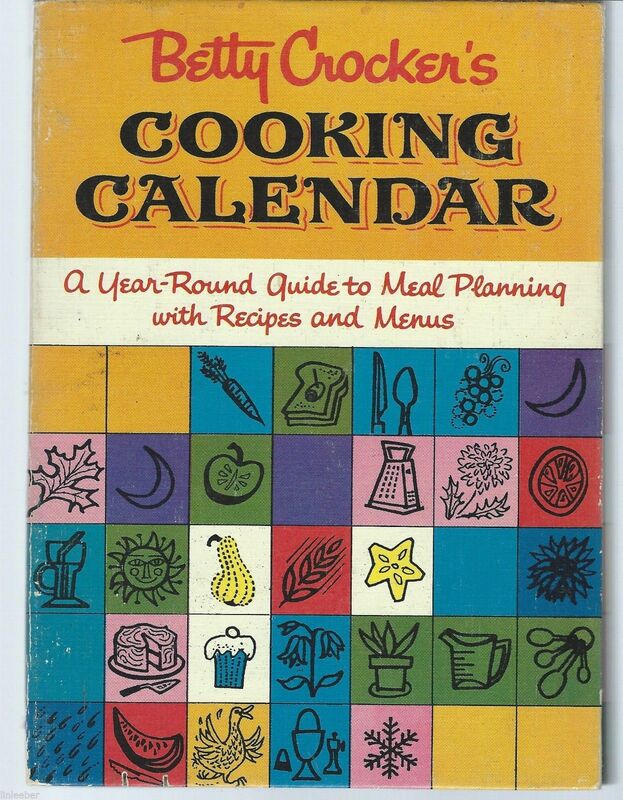 Betty Crocker's Cooking Calendar:A Year-Round Guide to Meal Planning;Menus 1962. Betty Crocker's Cooking Calendar: A Year-Round Guide to Meal Planning With Recipes and Menus; 1962. 1st Edition, 1st Printing. Illustrated by Gloria Kamen and Alice Golden. Hardcover, metal coil-bound book. Golden Press in 1962 First Edition, First Printing. PRINTED IN THE U.S.A. 176 pages of recipes and many color photographs for each month of the year. The book is 176 pages long and filled with interesting facts about each day of the year. There are menu suggestions, recipes and tips throughout the book. Recipes include Orange Baked Alaska, Turkey Divan, Steak Continental, Carrots au Gratin, Eggs Florentine, and Old-Fashioned Oatmeal Cookies. * Over 125 recipes make up seasonal menus such as Weekend Dinner, Ladies' Luncheon, Saturday Night Dinner Party, and Dad Cooks Out. The month-by-month breakdown highlights how to shop for seasonally-available fruits and vegetables, including signs of quality and varieties. * A date book and cookbook in one! Keep all your favorite recipes and tips together in this charming date book with space to keep note of birthdays, anniversaries, holidays, and other special occasions. Delightful illustrations, famous quotes, and fun facts make this a unique, value-packed book. January Best Buys: Broccoli and Oranges. February Best Buys: Cabbage and Bananas. March Best Buys: Onions, Lemons and Grapefruit. Winter Foods in Color. April Best Buys: Carrots and Pineapples. May Best Buys: Asparagus and Rhubarb. Spring Foods in Color. June Best Buys: Peas and Strawberries. July Best Buys: Greens and Berries. August Best Buys: Corn, Green Beans and Peaches. Summer Foods in Color. September Best Buys: Squashes and Melons. October Best Buys: Tomatoes, Peppers and Grapes. Fall Foods in Color. November Best Buys: Potatoes and Apples. December Best Buys: Cauliflower, Cranberries and Avocados. Table of Food Equivalents. Roasting Chart. Index. This book is filled with great vintage art, recipes, and cooking tips. Calendar pages have space for anniversaries, birthdays, and other important family occasions. Other special features of this book are seasonal party ideas, house and garden hints, a stain removal chart, an anniversary gift list, a food equivalent table, an herb guide, and a roasting chart. A good condition small 176-page Hardcover with Wire Spiral Binding. The book is in very good condition. The boards have a few very small smudges and scuffs but are otherwise in good condition. There is slight wear to the lower left front cover. There are 2 cut-in notches on the bottom of the front and back boards and shallow indentation on the bottom of the pages that correspond to the notches. The binding is not sprung; the pages are not pulled away from the binding. There are no rip, tears, holes, stains, or writing in the book-if it was used it was used very lightly. Sturdy binding. Pages clean and free of markings, although previous owner name neatly inscribed on inside front cover, along with a store price tag. Blue endpapers have faded to brown around the edges. This particular Betty Crocker Cook Book has no shortage of Monochromatic Illustrations and Drawings and color plates.